UMD’s Queer and Allied Student Union (QASU), has adopted a new logo. Submissions were open to UMD students and freshman Mads Reineke’s design was chosen by the board. At a general meeting earlier in the semester QASU told their members they were looking to update the logo. Mads submitted a few sketches of their design to the online form. In March the board notified them that their design had been selected as the new logo. Mads identified a few elements of the logo they really tried to focus on. Especially the prismatic effect. The old logo had the gender symbols as well and Reineke wanted to keep that element in the new design. They took their concept of the colored lights and tied it in with the gender symbols. Another element of the design is the incorporation of triangles. While not directly intentional it is a known symbol among the LGBTQIA+ community. Their triangle serves mostly for an aesthetic purpose to create repetition from the arrows in the gender symbols. 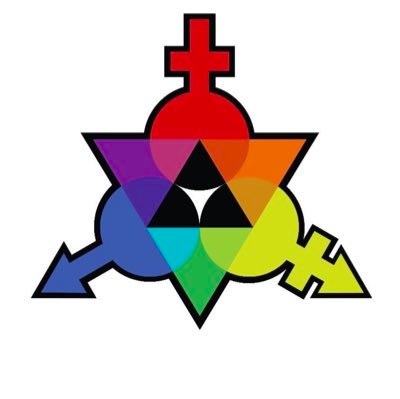 However they recognized the history behind the symbol, dating back to WW2 when a pink triangle was used by Nazis to identify homosexual and bisexual men, trans women and other LGBTQIA+ prisoners. Freshman Mads Reineke. Photo courtesy of Mads Reineke. Reineke expressed their appreciation for the club, saying even though it doesn’t always fit their schedule they are grateful QASU is here and they can go when they can. Merchandise featuring the new logo is available for order online through Wednesday, April, 3rd. QASU general meetings are held every Wednesday, follow them on social media for more information about QASU and Gaypril.